Learn how to massage and be massaged in return! DIY: Make your own Natural Painkillers! - Basic Anatomy & Physiology about the musculoskeletal system. 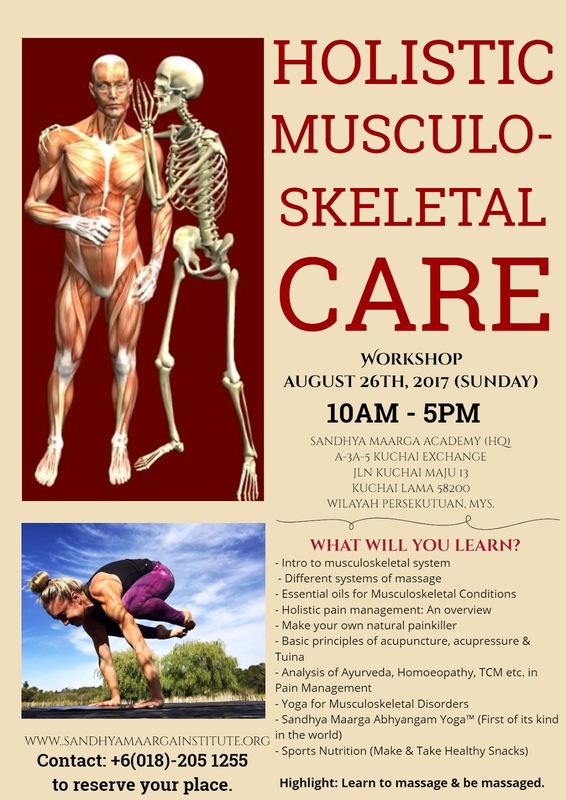 - Learn how each is related to each other to form a better understanding on how movement works and why pain, discomfort or diseases occur. Chinese Style Tuina, Western Massage, Swedish Style, Thai Massage, Indian Ayurvedic Massage, Shiatsu etc. - How different systems of healing view pain? - How can pain be managed with different modalities of healing? - How different systems of healing treat pain? The effectiveness of each modality is analysed and evaluated. - Tips on how to reduce the occurrence / possibility of injury. - History & Overview of acupuncture, acupressure & Tuina. - The role of acupuncture, acupressure & Tuina in pain management. - The evaluation of the efficacy of acupuncture, acupressure & Tuina in musculoskeletal diseases. 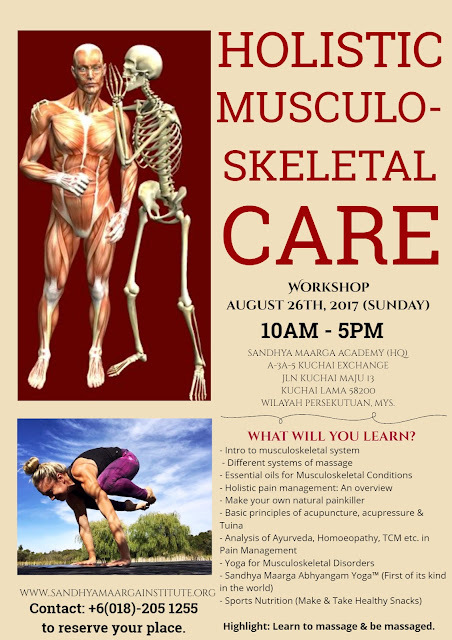 - Learn how essential oils can be used to complement acupuncture, acupressure & Tuina for Musculoskeletal care? - What is Yoga and how effective is Yoga in Musculoskeletal Care? - Is Yoga completely safe? 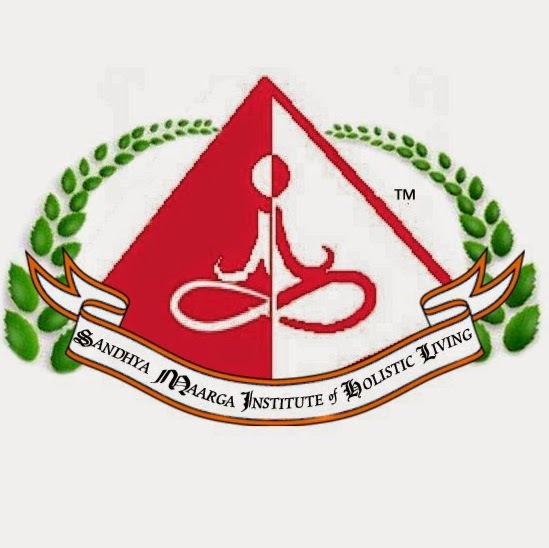 - The principles of Sandhya Maarga Abhyangam Yoga™. - Introduction to the different natural painkillers available. - DIY: MAKE some natural balms to soothe aches and pain. - DIY: MAKE a castor oil pack for pain relief. - Principles of Sports Nutrition. - Learn how to calculate BMI & BMR – the two vital factors in Sports. - Learn what food helps promote or counter pain, allowing you to choose a wiser option when you are active in sports. 9) DIY: Make Your Own Healthy Snacks! - Learn some simple and delicious recipes that can help give your musculoskeletal system a boost. As there are DIY activities such as making your own balms, a special Yoga session and a DIY Nutrition session, kindly RSVP at least 2 weeks before the event so that we may prepare the necessary items required for the number of participants accordingly. Forward the details to anyone you think you may be interested and we hope to hear from you soon. Thank you. Please contact us at 018-205 1255 to register for the event. Registration fee applies. Contact us at the same number for any other questions. It's far very crucial for sufferers of Rocky Mountain Acupuncture and Chinese remedy to recognize how acupuncture can help improve their symptoms, ultimately casting off the hassle this is inflicting them and improving their average health Rocky Mountain Acu.